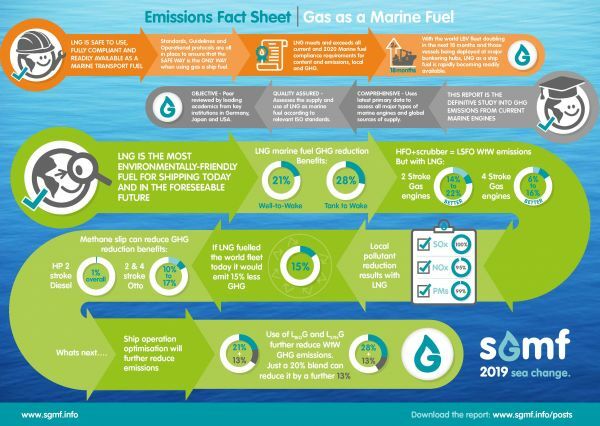 SGMF are pleased to announce the results of the Well-to-Wake (WtW) Greenhouse Gas (GHG) Emissions Lifecycle Research Study on the use of LNG as a marine fuel. The study which was commissioned by SGMF and SEA\LNG was conducted by independent specialist consultants thinkstep and reviewed by a panel of academic experts. It is the most accurate study of the life cycle GHG emissions and local pollutants from LNG as a marine fuel compared with current and post-2020 conventional marine fuels as it is done on a complete WtW basis. A copy of the full Well-to-Wake GHG Emissions Lifecycle Study can be downloaded from the thinkstep website. SGMF Members can download the Emissions Fact Sheet here.